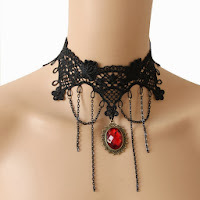 Right now you can get this Elegant Crystal Princess Style Lace Fake Collar Necklace for only $10.50 shipped! This necklace is perfect for any Halloween costume, wedding, and/or cosplay! Package include: 1 x Necklace / Package not including a Wisedeal Key chain gift. Our gift is key chain with Thermometer Compass function, please check picture carefully before buying.